LIFE’s policies are simple: they fix our problems. We address the causes at the root of the problems we face. Our only ideology is to be natural, practical and effective in delivering the solutions to allow us to live sustainably, with joy. Our policies are joined-up, they work together. For example: to make Britain the best place to live we need to change our support system, and to do that properly we need to make better decisions about the support we provide, and that means having stronger local democracy. You will see this joined-up thinking across the whole LIFE policy set. We are proposing to make some big changes, because we are facing problems that are just as big. Our policies will require every citizen to be more involved, especially in their local democracy. The reward for this greater involvement will be a more enjoyable life with a brighter future. We call it “Proper Change” for a reason, it is change for a reason and change that will deliver. The reason we believe that this level of change is needed is because we believe that the problems we face are severe, and that the time we have to solve them is short. 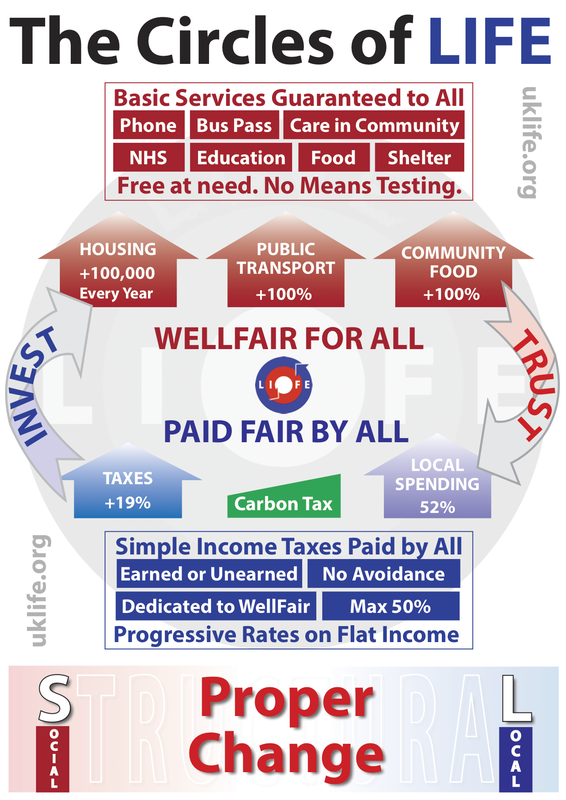 The places to start when exploring LIFE’s Policies are WellFair and Democracy. Use the menu above to navigate around, or use the list of pages below and at our SiteMap to find more.